Obviously you know about the BHCSC Club Website because you're here. The club has been maintaining a website on the Internet since 1998 when our Corresponding Secretary at the time, Kay Daly, created one after going to school to learn HTML. In 2010 Don Bullock became the club's webmaster because Kay could no longer keep up with the necessary changes. Due to changes in website creation software Don has recreated the website several times before creating the present one. We hope our members and guests find this website easy to use and informative. An important part of our club's purpose is educating people about our breed. As a club our goal is to create a resource for people in Southern California, and elsewhere, to learn about our wonderful breed of purebred dogs and help people find information about our club. We're attempting to make information easier to find and use. New material will be published on the website as time permits. If people are looking for information on Basset Hounds we want them to be able to find it here or be directed to somewhere else where they will find what they are looking for. 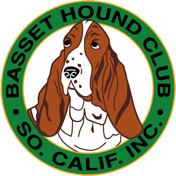 Our club website contains helpful information for people looking for a basset hound, either a puppy or an adult. Those who are looking for a basset might find some of our information regarding responsible breeders to be helpful. They may also want to check out our Member Breeder Directory. We feel that the moere people know about the breed and about responsible breeders the more likely they will make a good choice for their family. Unfortunately in our society there are bassets in need of homes and special care. Information about the different basset hound rescue groups is very vital to helping our breed. Their information and links to their websites is an important part of this website. Our Rescue page provides that information and links. In August of 2015 we launched a new venture for the BHCSC website, Mercantile Internet Sales. Our club has been selling t-shirts, sweatshirts, hats and hoodies at our club events and in now making them available to members and others via our website. Please feel free to offer material for the website. The webmaster is always looking for comical photos of basset hounds for the website's Whimsical Photos page. In addition the submission of pictures from our club events is welcome. The webmaster is also looking for articles written by our members about their bassets, breeding, rescue, care & feeding, health or just about anything related to basset hounds. They can be added where they are appropriate. If you'd like to submit pictures or material for consideration to be published on the BHCSC website please contact our webmaster. All material submitted must be original material created by the person submitting it and they must state that the information, illustrations or photos may be published on the BHCSC website. As with any publication the webmaster and the BHCSC Board of Directors have the right to edit or reject any material on this website. If you have suggestions or questions for the website please feel free to email the webmaster. Our Webmaster, Don Bullock, with one of his puppies (She is now called Pixie and lives with Ron & Mary Lukins).